To live a healthy life, a person needs to have a stressless and healthy brain, so that all the daily activities go smoothly and every hurdle can be handled in a better way. But in today's hectic schedule it is not easy to take special diet and keep an eye on brain health so our company has formulated the better formulation to combat the needs of present generation. Our formulation contains Methylcobalamin, Alpha Lipoic Acid, Folic Acid, Pyridoxine and Vitamin D3 uniquely formulated for neurological support. This product contains nutrients for nerve & brain health. It supports healthy nerve functioning as it promotes optimal function of central and peripheral nerves. Additionally it helps in preventing oxygen free radicals and oxidative damage whilst stimulating nerve growth and simultaneously targets factors that lead to neuro-degeneration. Furthermore, its nutrient profile helps to support mental alertness and overall brain health. It also enhances energy and stamina levels. It is mainly useful for people suffering from neurological pains, sciatica pain, diabetic neuropathy and neuralgia. There are numerous conditions associated with neuro-degeneration. These conditions are becoming more and more prevalent due to environmental toxicity, and poor diet with subsequent nutritional deficiencies. Mitochondrial insufficiencies appear to be at the root of neuro degeneration. The mitochondria, important cellular powerhouses, are also significant source of free radical production, even in healthy individuals. Vitamin B12, or cobalamin, is an essential vitamin for the proper functioning and development of the brain and the nerve cells. It plays an important role in the maintenance of the sheaths that cover and protect the nerves of the central and the peripheral nervous system, ensuring proper and faster nerve-impulse transmission. A fatty substance called myelin is essential for the formation of these sheaths. Vitamin B12 plays a significant role in the synthesis and maintenance of myelin. The neurological problems caused by vitamin B12 deficiency later in life are due to the damage caused to the myelin sheath. It is an important CNS antioxidant because it readily it crosses the blood-brain barrier, its ability to provide activity in both fat and water soluble environments allow it to quench free radicals within the cell membrane as well as cytosol. In addition to its own potent antioxidant effects, ALA is capable of regenerating glutathione. ALA is also a cofactor for two mitochondrial enzymes that are a key to energy production. In addition ALA enhances insulin sensitivity and provides important neurological protection. It is essential for methylation, necessary for healthy neurological support. Folic acid is crucial for proper brain function and plays an important role in mental and emotional health. It aids in the production of DNA and RNA, the body's genetic material, and is especially important when cells and tissues are growing rapidly, such as in infancy, adolescence, and pregnancy. Folic acid also works closely with vitamin B12 to help make red blood cells and help iron work properly in the body. Vitamin B6, also called pyridoxine, is a water-soluble nutrient that is part of the B vitamin family. B vitamins, including vitamin B6, help support adrenal function, help calm and maintain a healthy nervous system, and are necessary for key metabolic processes. 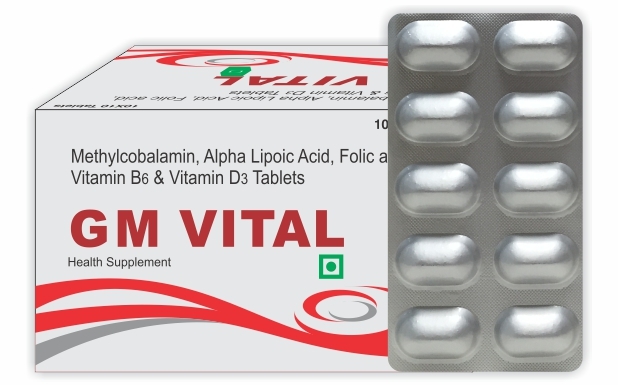 Vitamin B6 helps in the production of neurotransmitters, the chemicals that allow brain and nerve cells to communicate with one another, ensuring that metabolic processes such as fat and protein metabolism run smoothly, and is important for immune system function in older individuals. It is required to make the myelin sheath which insulates many of the nerve cells in the body. It has been found beneficial in preventing diabetic-neuropathy and the glycosylation of proteins. Also helps in preventing oxygen free radicals and oxidative damage which are implicated in the cellular dysfunction and complication of diabetic. It has many roles in regulating brain health, from aiding the development of the brain and nervous system to postponing decline toward the end of life. It is simultaneously target factors that lead to neuro degeneration, including immuno regulatory, antioxidant, and anti-ischemic factor. It clears amyloid beta peptide, and to prevent hyperparathyroidism. The product is possible safe for most adults. There is no disadvantage associated with the product if taken under the recommended usage. However, some are: headache, nausea, vomiting, and upset stomach.